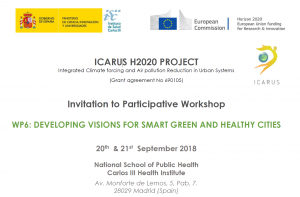 I am pleased to invite you to the participative Workshop for Developing Visions For Smart Green And Healthy Cities in the context of the Integrated Climate forcing and Air pollution Reduction in Urban Systems – ICARUS H2020 Project. This workshop will be held in Madrid hosted by the Carlos III Health Institute (ISCIII), on 20th and 21st September 2018. The aim of the workshop will be to identify the more relevant future trends, and to elaborate future narratives on green and healthy cities from the point of view of key stakeholder and strategic sectors experts. The workshop process is structured into two phases: (1) first day (20th Sept), experts will be encouraged to list future change factors and select the more relevant for the future of green and healthy cities in the longer term; and (2) second day (21st Sept), experts idea-sharing session and discussed with stakeholders from ICARUS cities. As a key stakeholder and expert from your city involved in the ICARUS project, your opinions are considered to be crucial to the discussions on the outcomes of the assessment study and the way forward for the European common strategy. Please feel free to contact Saul García (sgarcia@isciii.es) if you require additional information. I very much look forward to hearing from you and hope that you would be willing to accept our invitation.